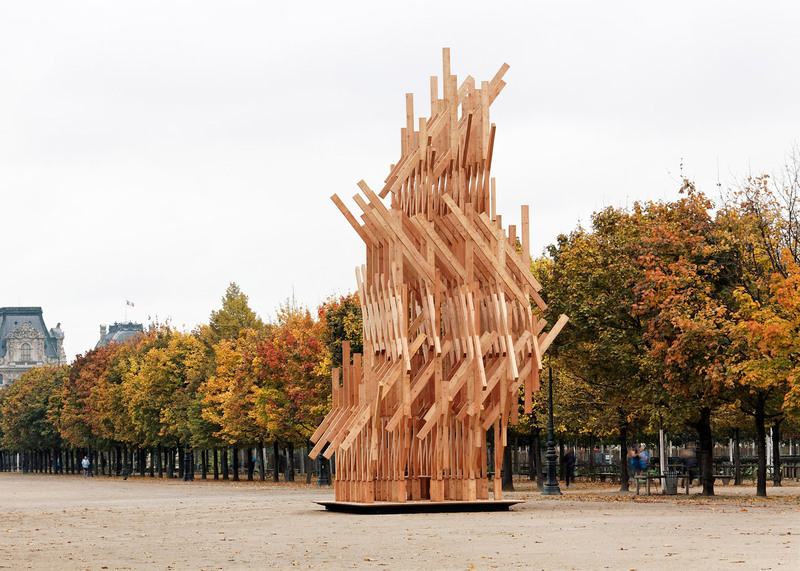 Visitors can clamber to the top of this pavilion by Japanese architect Kengo Kuma in Paris' Jardin des Tuileries, which is made up of a complex lattice of identical timber beams. Titled Yure – a Japanese expression for a nomadic shelter – the pavilion is made up of identical wooden strips which have been arranged in a lattice-like composition. "The pavilion consists of identical wooden pieces that have been stacked, twisted and assembled to create a poetic dynamic volume," said Kuma. "It offers an organic geometry by a geometric composition of wood." This assembly technique allows the structure's appearance to change depending on the perspective. From one angle it appears to be a closed and complex matrix, and from another; an open lattice. "From each side of the structure the view is different," said the architect. "The main approach offers a see through, thin silhouette – while from the other side, the way of perceiving the space is changed. In this way the space diversity is achieved." The structure is divided into small areas over three separate floors – each of which can be accessed via ladders. Kuma's diagrams of the pavilion show two teepee-shaped fabric tents on the ground- and first-floor levels. According to the architect, these enclosures are intended to create a secluded bedroom and a lounge space, while an open viewing platform looking out onto the surrounding environment is located on the highest level. The Yure pavilion is the latest in Maison d'Edition project – a series of commissions by Galerie Phillipe Gravier that has previously included last year's structure made up of aluminium cubes by Japanese architect Sou Fujimoto. The pavilion is one of a number of installations and events taking place for the FIAC art fair at the nearby Grand Palais, and will be open to the public until 4 November 2015. Kengo Kuma & Associates recently unveiled plans for a cave-shaped and plant-covered museum dedicated to Filipino history. Photography is by Antoine Baralhe.